A while ago Running Past covered the Lee Centre – originally a hall and meeting place built in the late 1880s originally known as the Lee Institute ‘For the use and benefit of the men and lads of Lee.’ There was similar organisation and building less than 50 metres away when it was built – it was known as Lee Working Men’s Institution. The building and its successor, which was a warehouse for Chiesmans store, have an interesting history. With the words ‘working men’ is in the name one could be forgiven for thinking that Lee Working Men’s Institution was, perhaps, akin to a working men’s club – somewhere for the working class of Lee to meet. It was nothing of the sort; it was very much the preserve of the wealthy of the parish – although this wasn’t how they saw themselves. The original venue for the Institute was in Boone Street, numberless, but between 9 and 11 in the 1870 Kelly’s Directory, its likely location is shown below. It opened its doors in September 1854 – to a packed room, with a number outside, its chairman, a Mr Bennett of Blackheath suggested that members should ‘recognise no class – the corded jacket should have as much respect as the black coat.’ It was seen as a means of sharing knowledge through lectures and the printed word – a lending and reference library and reading room books and newspapers (1). Unlike equivalent halls elsewhere, there was to be no popular entertainment – musical hall type acts or the like. The original plan was for members to deliver lectures on their trades so that others could learn from them (2). In practice though most of the lectures seem to have been given by Dr William Carr, the local GP – who gave talks on subjects ranging from ‘Low Prices and How to Profit from Them’ (3) to ‘Life in Russia’ (4). A recurring theme though was poverty, drunkenness and overcrowding amongst the poor in the neighbourhood – Carr lecturing on this in 1864 and ‘gave great satisfaction’ to a ‘large attendance’ (in the small hall) (5); it was a subject that he returned to in 1871 (6). Other lectures in 1868 were noted to include the dwellings of the poor, Trades Unions (7). The Institution was home to a variety of other meetings, including Deptford and Greenwich Unemployment Relief Fund in 1866 (8) as well as the Lee and Blackheath Horticultural Society. A frequent speaker there was also Dr Carr, who on New Year’s Eve 1868 gave the 3rd in a series of, no doubt, riveting lectures on ‘The food of plants and the sources from whence it is derived: the absorption and circulation of fluids and respiration.’ There is no report as to the numbers attending and the impact that it had on the trade of the neighbouring pubs, notably the Woodman (9). 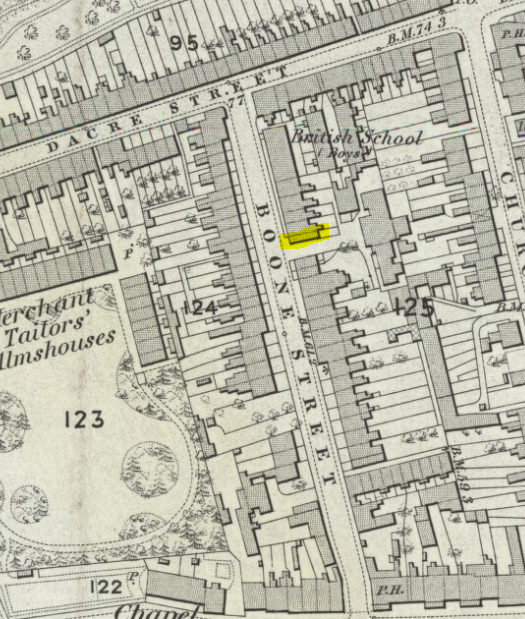 By 1866 they had started to look for larger premises than their small room in Boone Street and were looking at a site around the junction of what is now Kinsgwood Place and Dacre Park – ‘the very centre of Lee’ (10). By this stage they had around 500 members and included a temperance society ‘which found a home within their walls’ as they recognised that ‘their great rival’ was the public house (11). This temperance society seems to have become part of the national Band of Hope by 1871 (12). By 1868 the land had been bought and there was a fund of £400 that had been put aside for the building work (13), which was added to later that year by a bazaar which was held in the grounds of Blackheath College (now Blackheath Hospital) in Lee Terrace and took over £400 on the first of 3 days (14). The Institution ran ‘benefit clubs’ for the poor along with a ‘coal club’ too (15). The move from Boone Street took until 1877 to happen though – there seem to have been problems with the site on Dacre Park and then issues with permissions from the local Board of Works, these delays seem to have cost the Institution as, by 1875, despite the regular fetes and bazaars they had only £600 in the bank towards the likely costs of £1100. A contract was signed though with Messrs Gates of Lee and Eltham to build on a new site in Old Road, on what is now behind shops on Lee High Road (16). comprising a library and reading room on the ground floor, with club and committee rooms above and in (the) rear a hall, well lighted, with seats for 400 persons; there is a library of 800 volumes and the reading room is well supplied with daily and weekly newspapers and periodicals. Similar fayre continued in the new home for the Institution, although without the inimitable Dr Carr who died in 1877. This included a winter series of ‘penny readings’ where members recited poems, gave readings and sang relatively serious songs, ending with the National Anthem (17) . With a larger venue, classical chamber music began to be offered to the locals of Lee (18) – although sometimes with ‘moderate’ audiences (19) and also it became a venue for amateur dramatics (20) The Horticultural Society continued to meet there and put up a lean to enable the growing of peaches (20). The move seemed to be a success with 1000 members reported in 1880, with popular life assurance and sickness benefit schemes, the coal club continued and the Lewisham, Lee and Blackheath Buidling Society, formed in 1877, was based there. There was still a debt on the building but this was being paid off (22). In some ways the Institution was becoming the very model of self-help suggested by the eminent Granville Park resident Samuel Smiles. Children’s entertainment had been added to the repertoire of the Institute by 1885 including the dissolving view entertainment – a form of magic lantern (26). Around the same time quadrille classes started to be offered – perhaps the salsa of its day (27). During the 1880s it seems that any pretensions of this being a working men’s club had disappeared and it was more commonly known as the Lee Institute. Penny readings continued into the 1890s (29). The structural problems that had led to the decision not to renew the musical licence appeared to have been sorted out as the Kentish Mercury reported in early 1895 that the Institute was ‘now available for concerts and kindred entertainments.’ (30) This was to include several variety hall type evenings, which the original founders would no doubt have frowned upon and would have been more akin to the entertainment offered at the Lee Public Halls 15 years before (31). Kelly’s’ Directory noted the continued presence of the Lee and Blackheath Building Society from 1890, as well as Tax Offices in the 1901 edition. However, by 1906 there was no mention of the building, with the Building Society having switched its operations to the opposite side of the road in the St Margaret’s Parish Rooms. What had happened isn’t clear, whether the previous structural problems had remerged, tastes and expectations had changed or whether a small area couldn’t support two similar type buildings (the church hall of Holy Trinity, Glenton Road, now called Lochaber Hall, was being planned too). 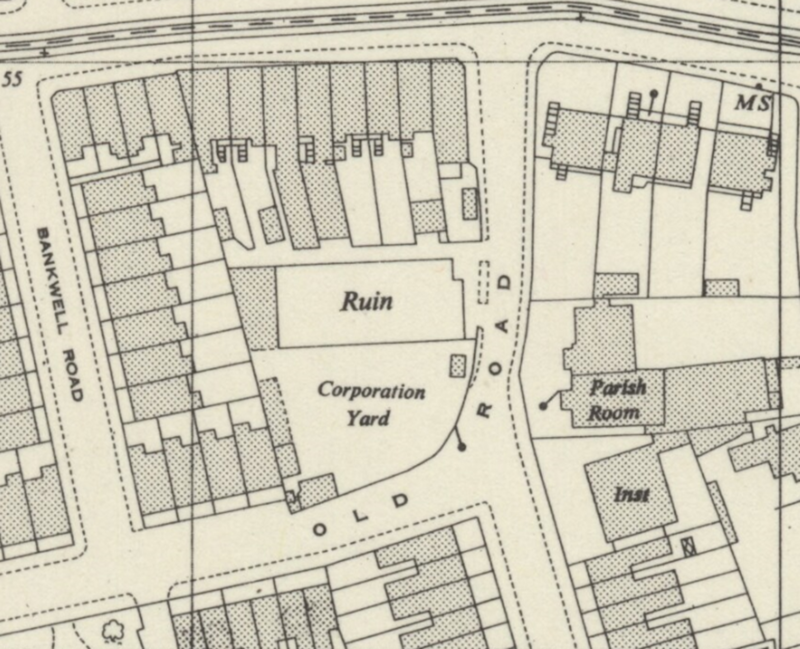 It was to be used by Chiesmans (their shop in Lewisham is pictured above) for many years despite being seriously bomb damaged in World War Two, with the Ordnance Survey cartographers describing it as a ‘ruin’ in 1950 (see below). It was listed in the 1942 Kelly’s Directory but had gone by 1943. 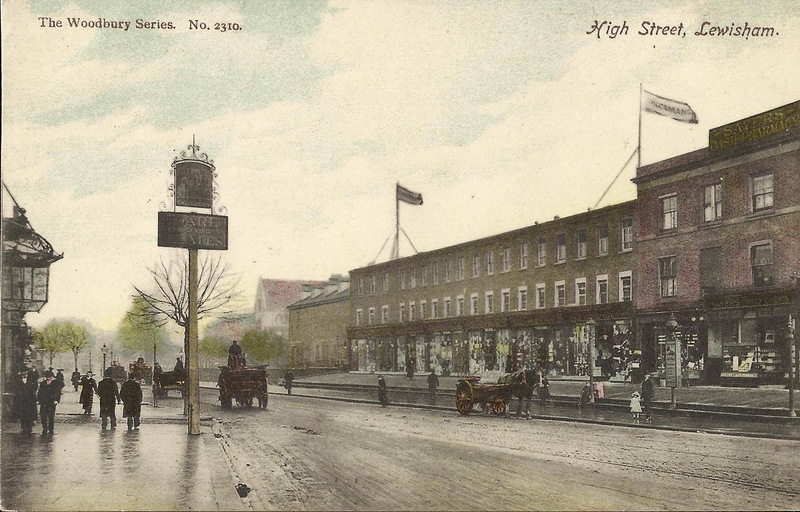 In the years after the war there were various applications to refurbish and extend the building, including the building of an additional storey on the front of the building for use as a piano store. These were refused by the post war planners and in the end rebuilding to a uniform height of three storeys was approved in 1951. 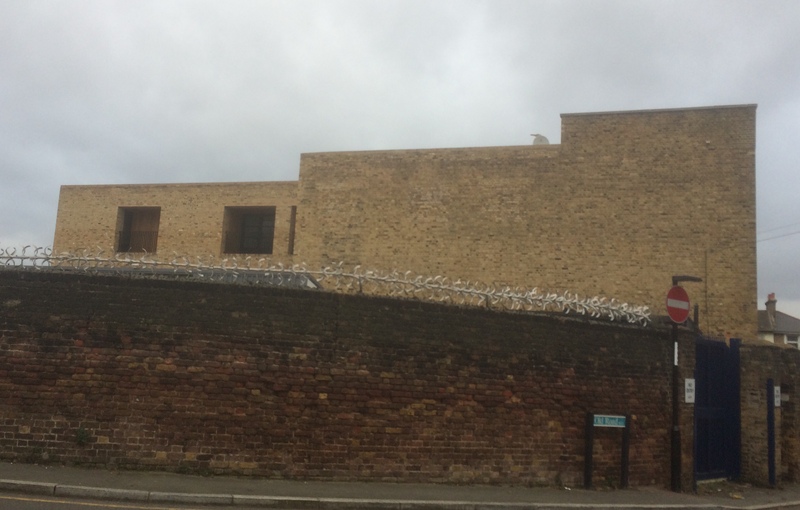 Presumably the brick shortages after the war meant that it took a while to be rebuilt – the first post war listing as Chiesmans was in 1959, their usage of the building continued until the mi-1980s. By that stage the firm had been bought out by House of Fraser who rebadged it as Army and Navy. It didn’t last long the repository had closed by 1985, with the Army and Navy store in Lewisham closing its doors for the last time in 1997. On the shop site is now ‘probably’ the largest police station in Europe. 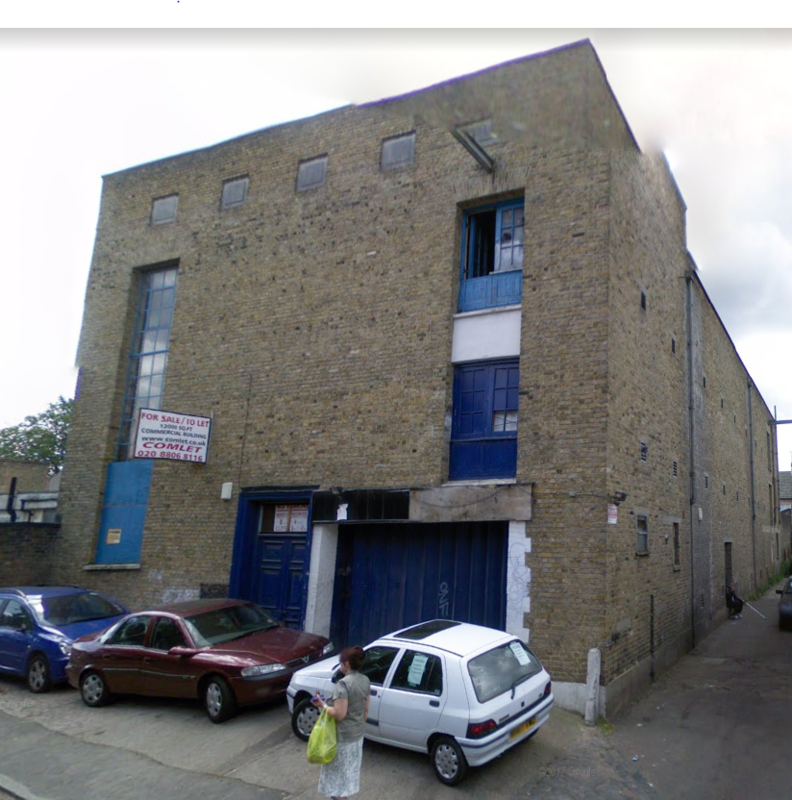 In the recent past it has had long periods empty (see above from Streetview in 2008), has been squatted, there were attempts to set up a indoor combat venue and was used as an auction house. Planning permission was eventually given for flats in 2014, although the actually building work has stuttered a lot with periods of activity followed by months of inactivity. 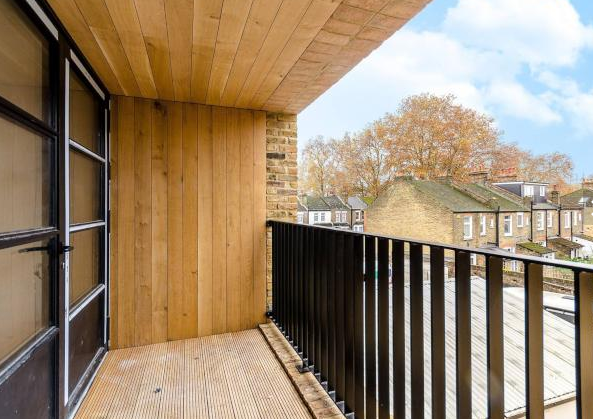 The ‘stunning warehouse conversion’ properties were marketed for rent only in early 2019 with the 4 bed at £3,995 a month, 2 bed at £2,150 or £1,900 and the 1 bedroom flats at £1,650. 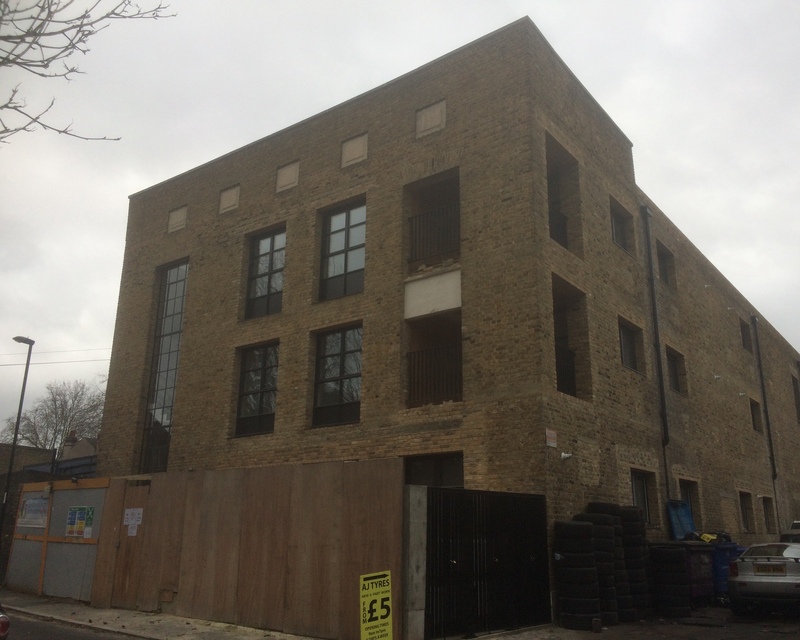 This entry was posted in Uncategorized and tagged 87 Old Road, Band of Hope, Boone Street, Chiesmans, Dr William Carr, Lee Centre, Lee Working Men’s Institution, Lewisham Lee and Blackheath Buidling Society, Lochaber Hall, Old Road, Samuel Smiles, The Woodman on January 30, 2019 by Paul B.